In a way, Adeola’s journey started when he fell asleep in a job interview. That led to a sleep apnea diagnosis, and once he was able to treat that, many things in his life started falling into place. That diagnosis allowed him to lose an incredible amount of weight. Shortly after that, he was diagnosed with ADHD, dyslexia, and dyscalculia. In this conversation, he shares how he embraced education, and that allowed him to manage these things. [03:49] – Adeola explains his history with OCD and how he has worked to overcome some of those challenges. 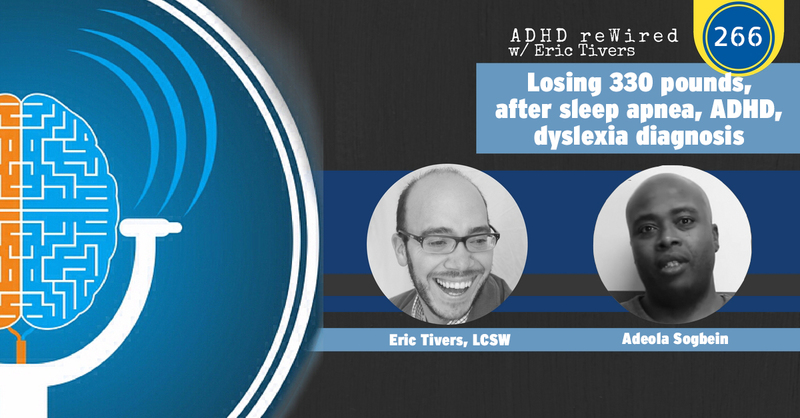 [06:43] – Adeola describes what was going on in his life when he was diagnosed with ADHD. Things started with a sleep apnea diagnosis. [09:14] – A book on Adult ADHD changed Adeola’s life. [11:07] – Three women came into Adeola’s life and helped him through this period in his life. He also shares some of the resources he accessed. [13:24] – Adeola talks about receiving his ADHD diagnosis and describes his emotions following that diagnosis. [19:00] – I explain the idea of the domino effect. Adeola identifies sleep apnea as that first domino. [22:46] – Adeola shares how he started this journey through education. [24:44] – We talk about how important it is for children with IEP’s to know what is on their IEP and why they receive certain accommodations. [27:10] – Adeola was just recently diagnosed with dyslexia and dyscalculia. He expresses that he finds it difficult to explain this to neurotypical individuals. [30:23] – Finding a proper support group has played a huge role in Adeola’s success. This leads to him describing some of his exercise routines. [33:44] – Adeola explained how moving to the right apartment for him helped him with his ADHD symptoms. [36:48] – As he worked through his ADHD symptoms, Adeola re-engineered his life. He shares what he means by “re-engineering life” and explains how he did it. [44:45] – Adeola has gone back to school and talks about his experience with online classes. [48:11] – Adeola shares how he views himself now that he has lost a significant amount of weight. [51:40] – Adeola says that once his sleep apnea was under control, everything fell into place. He also talks about the importance of drinking the right amount of water. [56:28] – Adeola talks about the book he wrote on his journey.